Big day around the corner? 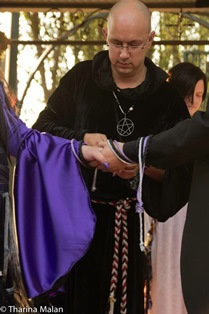 If you require a Religious/Marriage Officer to solemnize your marriage or civil union, please contact a Pagan RMO in your area for further information. The Services of a Pagan RMO are for free, as per the Civil Union Act. This means an RMO may NOT charge you for services rendered. Travelling cost, accommodation and refreshments may be paid by the wedding party for the RMO. Some RMO’s may work in conjunction with wedding co-ordinators, who are independent (possibly not Pagan) and may work for a predetermined and negotiated fee, which if agreed upon, must be paid to them and not the RMO. The services of the RMO are for free. Would you like to be registered as an RMO? You can find the SAPC Membership Application Form HERE. Signed RMO application form, found HERE. Telephonic interview with the RMO Committee. Written motivation from the applicant or a nominating letter from his/her Coven/Group.